Panda-Monium Pink, my signature nail polish color! Over at www.LettersToOhio.com Antoine frequently updates on what he’s thankful for that day. It started as a challenge that a friend proposed to him-every day write down 7 things that you are thankful for and you are NOT allowed to repeat. I didn’t even think about attempting to commit myself to such an undertaking because I knew that I’m not disciplined enough. I am honestly amazed at the fact that I’ve managed to be so consistent when it comes to updating this blog. It’s VERY difficult for me to commit myself to daily tasks/rituals. Some great examples of this are that I don’t talk to my closest friends everyday and my routine varies from day to day-it’s never the same. But for today I’ve decided to make a list (not quite 7 though) of things that I’m thankful for. And then I’ve decided that tomorrow I will try to carry on that list, and so on and so forth. I will have to take it one day at a time. I’m wondering if perhaps I don’t give myself enough credit-maybe I am more disciplined than I realized? Time will tell. This morning my hair was an INSANE mass of shrunken curls that were not trying to cooperate. After a few splashes of water, some hair gel and the security of bobby pins, I have a funky hairstyle that has saved the day! 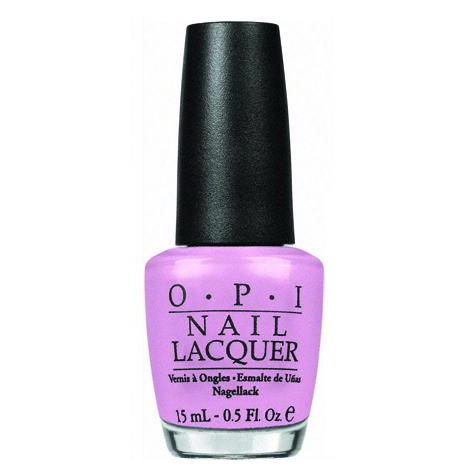 This is quickly becoming my favorite OPI nail color (move over Thrill of Brazil) and makes me smile every time I glance down at my finger nails. When I got the news about point #1 she was the first person I called…I love her more than this world will EVER know.